Even something that you create without the help of any other human has a connection to the non-physical realm, and you had to have been inspired by something or someone that you experienced there on Earth. So everything is collaboration and co-creation, and more and more of you are getting that. We invite you to reach out and up to connect with us regarding your desired co-creations. We are not only happy to assist, but we also have very little else to do. So we often work on projects, even before we are asked for our help, and we will continue to co-create with all of you at night when you are asleep. There is certainly much more for us to gain from connecting with all of you because of the multitude of experiences you’re having and emotions you’re feeling. We are always available. There is never a line to wait in. We are always open, as well, to new ideas for collaboration. And so, you can think of us as your number one supporters, no matter what the endeavor. And if you feel for our support and our energy, while you are embarking on one of your action journeys, you will absolutely feel the support that we are giving. 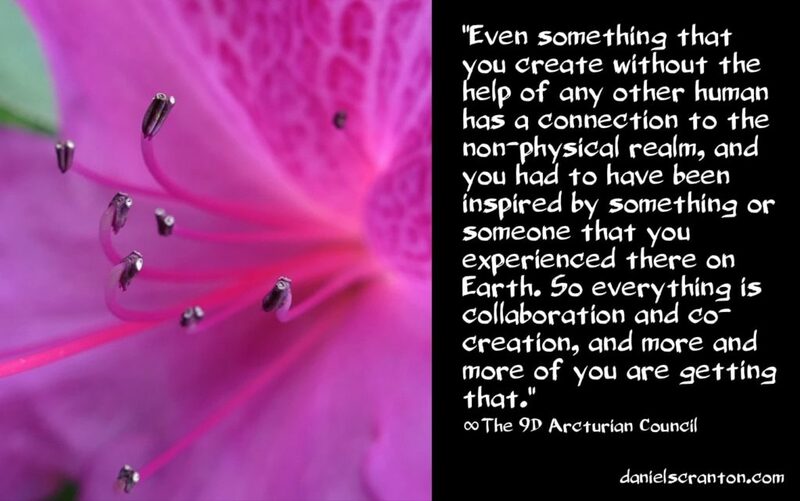 This entry was posted in Uncategorized and tagged Arcturian Council, Daniel Scranton, everthing is collaboration abd co-creation, love, reach out for desired co-creations. Bookmark the permalink.